Welcome to the homepage for Schild en Vriend, a bunch of miniature wargamers operating in Vlaams Brabant, Belgium. We cater for several periods and scales in miniature wargaming, ranging from the earliest times to the far future, and from the bottom of the oceans to the deepest of space. 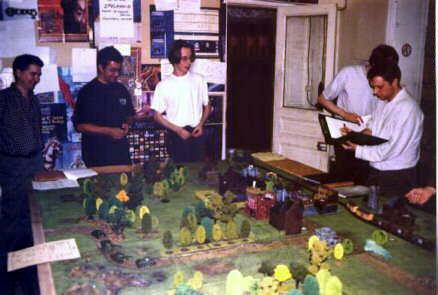 The links to the left lead to several pages on our activities and on miniature wargaming in general. There is a lot more to miniature wargaming than just playing with toy soldiers of course, as the hobby brings together such various activities as researching history, painting figures and modelling terrain along with the gaming itself. This variety is what makes miniature wargaming such an interesting and rewarding hobby. Feel free to browse this site from the links on the left for more information on our club and the hobby in general.